This 5 Foot Double Sided Slim Bin Slatgridwall can turn your entire store into a sea of inexpensive walls. Works with all slat grid bins and accessories to allow for display of almost any item. Standing at 60-inches tall with a width of 24-inches, you can create an extensive array of displays for your business ranging from candy, apparel accessories, fun loving souvenir items and more with this grid floor display without taking up a lot of floor space. Group similar items together to make shopping convenient and a breeze for your customers and easy for your staff to restock. 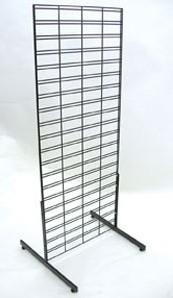 This wire grid panel fits most metal accessories such as hooks, brackets and shelves allowing you to make a unique display in your shop. These slat grid walls are sure to boost your sales as customers can have more access to clearly see and shop all your items. Order your metal freestanding floor fixture today at Candy Concepts Inc.